FIRE EXTINGUISHER OAK CABINETS Surface mount fire extinguisher cabinet allows you to hide an unsightly extinguisher in plain sight for safety. These high quality cabinets feature solid construction. Contemporary engraving on the door panel compliments any decor. These cabinets easily accommodates up to a 10 lb. fire extinguisher. Heavy duty mounting hardware is included. 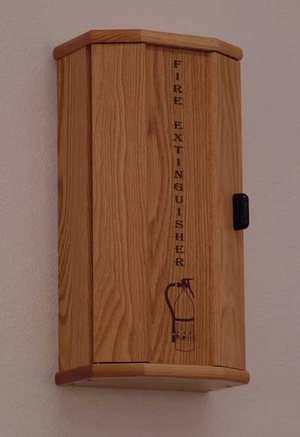 Surface mount fire extinguisher cabinet allows you to hide an unsightly extinguisher in plain sight for safety. These high quality cabinets feature solid construction. Contemporary engraving on the door panel compliments any decor. These cabinets easily accommodates up to a 10 lb. fire extinguisher. Heavy duty mounting hardware is included.